Zark's Burger Offers Unlimited French Fries - Hurry! 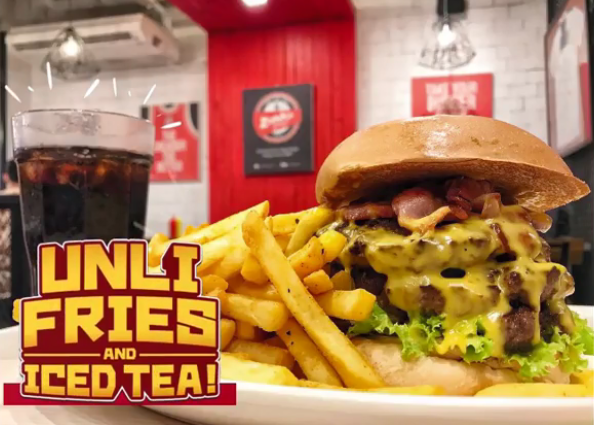 Zark's Burgers announced new offer to French Fries lover with bottomless iced tea. Zark's Burger is giving to all its customers unlimited French fries they want - to satisfy their cravings for only P99 with any burger purchase to avail. The deal includes bottomless iced tea together with Zark's best-selling Ultimate Burger. Zark's Burger is popular of serving American comfort food, especially huge, yummy burgers - and no other could beat them in terms of freshness, size and taste. On their Minor and Major League of choices, both of which containing burgers with one-fourth and one-half pound patties, there are a lot of must-tries.